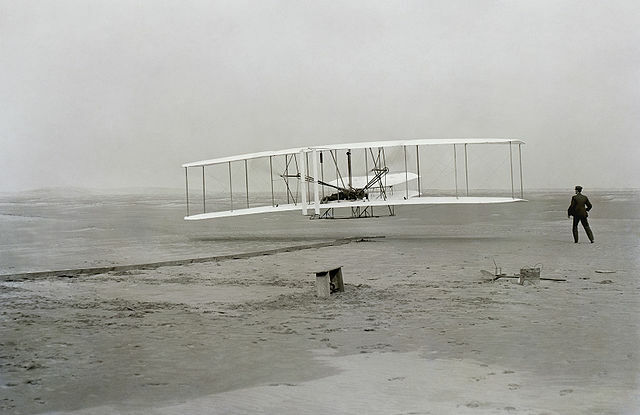 On December 17, 1903, the Wright brothers took to a beach near Kitty Hawk, North Carolina, with a contraption which they believed would take flight if used properly. Orville stepped onto the machine, lying down to steer. Wilbur, seen at the aircraft’s right, helped launch the Wright Flyer skyward. The moment was captured in the iconic photo above, proving to the world that humanity had achieved powered, control flight for what is widely believed to be the first time in our collective history. But who took the picture? It turns out, that’s a story in and of itself. 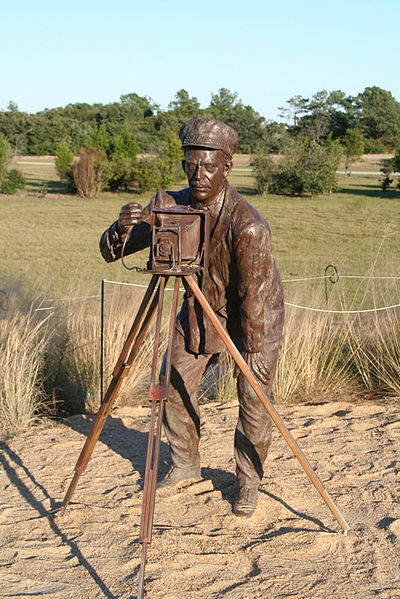 The photographer was a man named John T. Daniels, and his role in the historic event is memorialized in bronze — there’s a statue of him, pictured below, at the Wright Brothers Memorial in Kill Devil Hills, North Carolina, close to where the above-pictured flight occurred. Daniels is depicted operating Orville’s camera — a Gundlach Korona view camera which cost $85 (about $2,300 in today’s dollars), according to one source. Orville owned the expensive camera because apparently (and unsurprisingly), he and his brother had a keen interest in all things mechanical, and had a wide range of photographic equipment. (Orville Wright’s estate contained over 300 negative photographic plates, which were acquired by the Library of Congress in 1949.) The brothers understood the incredible importance of capturing an image of the first flight of humanity, and brought Orville’s camera with them to ensure that something no one had ever seen before would be seen throughout the world. Daniels was one of three men who were members of the Kill Devil Hills Life-Saving Station, a group which was likely a mix between a municipal life guards and Coast Guard officers. He and the other men of the Life-Saving Station met the Wright brothers during the latter’s visits to the Kill Devil Hills — a somewhat regular event, as the brothers were scouting the area to set up for the flight. Orville asked Daniels to operate the camera, but not because Daniels had experience doing so — far from it. An airplane taking flight was not the only “first” that Daniels would lay eyes on that day, for before December 17, 1903, he had also never seen a camera before. Orville gave Daniels a quick tutorial and went into the plane. Daniels, who had also never used a camera before (which, given that he had never seen one prior, should be obvious), almost forgot to actually squeeze the bulb. Thankfully, the flight — about twelve seconds of air time — was long enough for Daniels to overcome his excitement and take what would soon become one of history’s most famous photographs. Bonus Fact: Daniels was part of another historic first that day — if you asked him, at least. The Wright brothers took to the skies four times that day, and after the final flight, a gust of wind lifted the then-unmanned plane above the ground. Daniels, according to his Wikipedia entry, grabbed at the plane in an effort to keep it on the ground, “but he was caught between the wings as the Flyer flipped end over end. Daniels was not seriously hurt, but the Flyer was destroyed with even the engine block split in half.” He’d cite as part of another claim to fame: that he was involved in the first-ever airplane crash, and survived. From the Archives: A Million Years, Give or Take: The worst prediction in the history of the New York Times, as demonstrated by the Wright brothers. 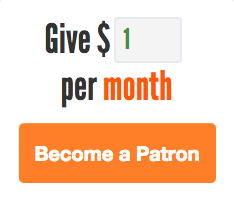 Related: A really cool kit to build a 1:20 scale model of the Wright Flyer. 4.5 stars on 15 reviews.